A 14-year-old schoolboy suffered horrific burns when a deodorant can exploded during a prank – turning him into a human FIREBALL. Kyle Round and a friend were messing around with a Sure aerosol and a cigarette lighter when the freak accident happened. The teenager accidentally dropped the can because it was hot and it exploded when it hit the ground engulfing his face and arms in flames. Terrified Kyle managed to extinguish the blaze by rolling in a puddle while his pal dashed to a nearby pub to raise the alarm. 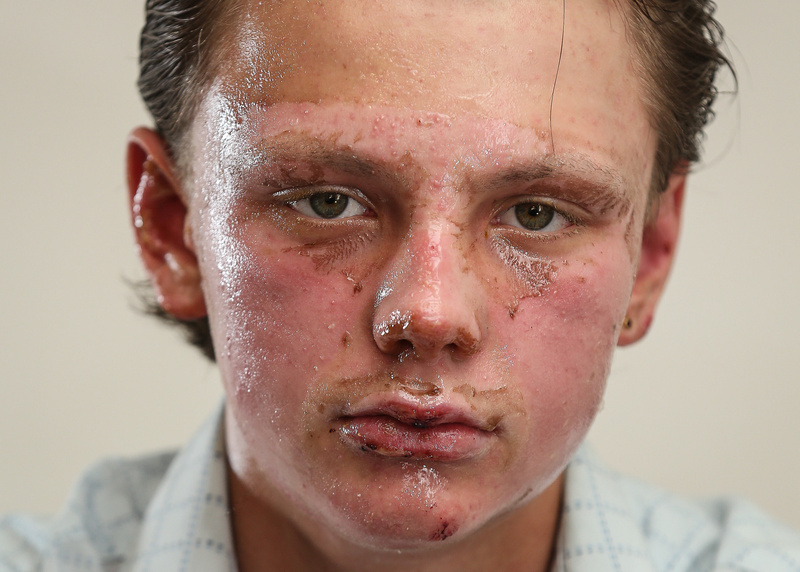 An ambulance rushed Kyle, of Underwood, Nottingham, to the city’s Queen’s Medical Hospital where he was treated for 12 per cent burns to his face and body. Following the accident, which happened last Tuesday (19/7), his parents Wayne and Alyssa Round have released shocking pictures of Kyle’s injuries to warn others about the dangers of playing with fire. Factory worker Wayne, 36, said: “There’s a brook in the woods, and the weather was so hot, so I was surprised there was any water was left in there. “He put himself out, took his t-shirt off and ran up the hill to where the football fields are. 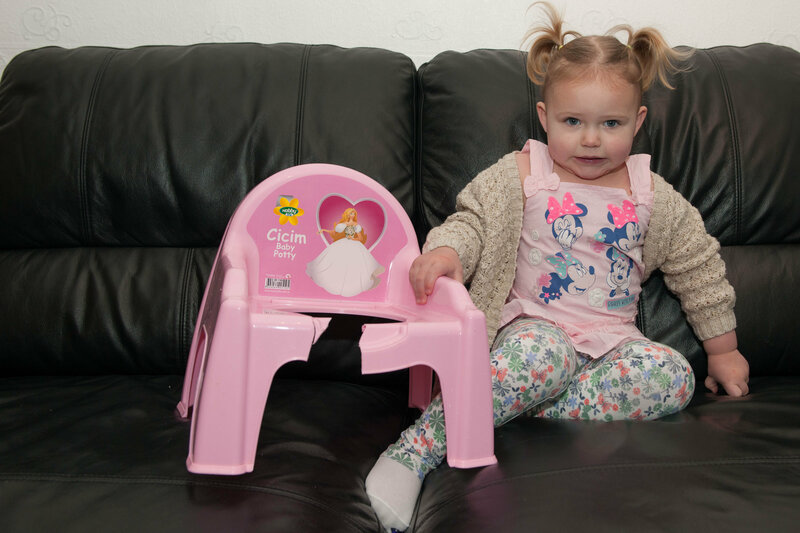 “Luckily, our next-door neighbour was in the pub when Kyle ran in, so he called 999 and let me and Alyssa know. “We were gobsmacked. Of course we were angry at him, but we can’t be mad at the moment. “It wasn’t even his deodorant – it was his friend’s. “He is in a lot of pain and he was quite shaken up. “My son basically went up in flames and he is incredibly lucky that he got off lightly. It could have been really bad. “Those canisters can be so dangerous if you are playing around with them. I think kids think they’re invincible. “Everyone likes to play with their mates and have a laugh, but you have to have some element of safety. “It was a compressed Sure can. Because it’s compressed it exploded much worse than a normal deodorant. “He was stupid and he didn’t think of the consequences. All teenagers mess around and fooling around with lighters isn’t something out of the ordinary. “Unfortunately, Kyle was one of the unlucky ones, but his injuries could have been so much worse. “People need to realise that this does happen. “Kyle is in a lot of pain and is really itchy because all the dead, burnt skin has to be peeled off. As a result of his injuries, Kyle has been told to avoid direct sunlight for two years in order for his skin to fully recover. Mum Alyssa, 33, added: “They said it should take three weeks to heal as the skin needs to repair itself. “But he has to stay out of direct sunlight for two years, and it could take up to four years for the colour all over his body to return. “We have to wash him down using sterilised wadding and gloves with warm water. “We wipe him down, get all the skin off and put polyfax ointment on his face in thick layer to form a protective barrier to prevent infections. “He can’t touch his arms because they’re both covered. “He also has a slight burn on his leg, less than a palm size. “He needs to keep constantly hydrated because his wounds keep weeping. “We have to take him back to the hospital once a week, but sometimes it can be two or three times a week depending on how he heals. “If it doesn’t heal on his arms then he might need to have a skin grafts. “He hardly sleeps because he can only sleep on his back. If he sleeps with his arm on his face, the wounds stick together and all the skin rips off his face. “I have to wake him up at 3am to give him his tablets because every six hours he has to have to have tablets and morphine, as well as a wash.
“It’s safe to say aerosol deodorants are now banned. We are changing to sticks. “The burns unit have done so well, so I’m trying to come up with a kickboxing event to raise money to give something back to them.